Editor’s note: This is the first of a two-part story about the history of the Tsalteshi Trails, which are the main training ground for three central peninsula high schools and the local centerpiece for skiing and running competitions. This week’s article discusses how the land was acquired and the trail-making was begun. Next week’s article will demonstrate the unqualified success of the trail system and its continuing growth and refinement. Photo courtesy of the Fair Family Collection. Will Troyer glides on his wooden backcountry skis in a more remote section of the Kenai National Moose Range. 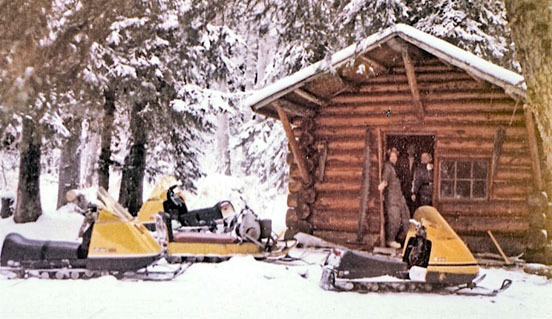 Before the Tsalteshi Trails were constructed, many people routinely skied in the backcountry. During a bicycle ride in the spring of 1987, the fate of cross-country skiing on the central Kenai Peninsula began to shift upward. Prior to 1980, Nordic skiing on the peninsula had been mostly a backcountry affair, although the Kenai National Moose Range offered a few miles of groomed trails near Soldotna and allowed for some racing to occur in the area of Headquarters Lake. Kenai Central High School had a cross-country ski team, as did Homer High School, and the chance to compete gave the sport focus and energy. 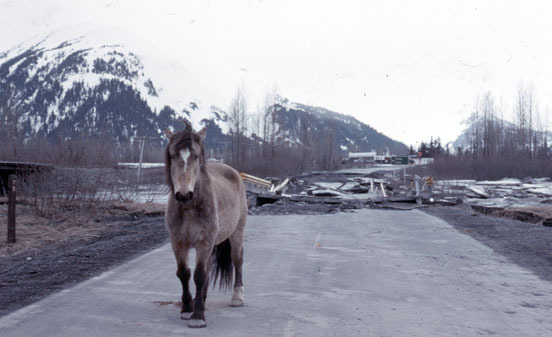 With the passage of the Alaska National Interest Lands Conservation Act in 1980, however, the moose range became the Kenai National Wildlife Refuge, and the management plan there no longer supported racing or related events. As a consequence, enthusiasm for the sport began to wane. The KCHS team disbanded in the early 1980s, and when Soldotna High School opened in 1980 it did not include skiing in its sports repertoire. Meanwhile, the Kalifonsky Nordic Ski Club, which had begun in the late 1960s, also faded in popularity and was in need of new members and fresh ideas. The last president of the club, Alan Boraas, and club member Charlotte Ischi went into the bank and closed out the club account. 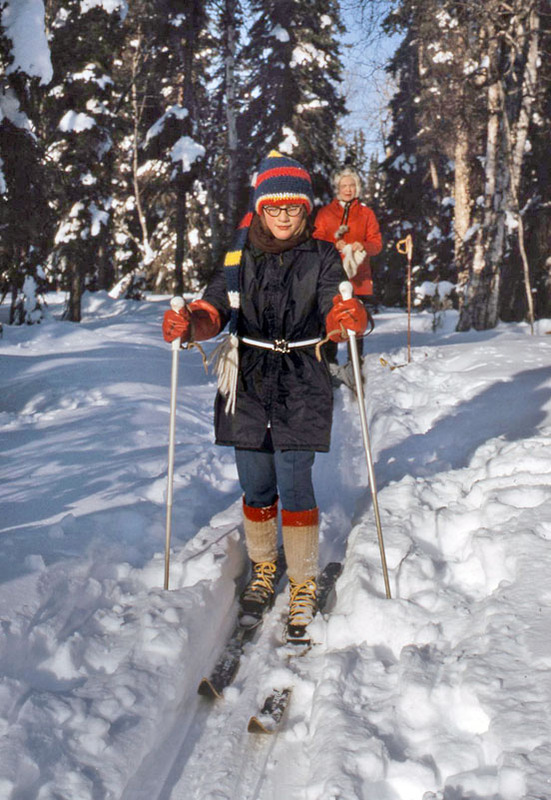 They then created the Kenai Peninsula Nordic Ski Club, and in the mid-1980s attempted to create a new trail system near Centennial Park along the Kenai River. But the new trails were not of the caliber necessary to attract a large following, and so widespread interest in Nordic skiing remained tepid. Then came the fateful bicycle ride. Photo courtesy of the Fair Family Collection. A pair of cross-country skiers ply the Nordic trails on the Kenai National Moose Range in March 1972.
when he reached the top of the big hill just south of town. At about Mile 98 of the Sterling Highway, he was surprised to see that a huge swath of the hilltop forest west of the highway had been bulldozed and that the land was being prepared for the construction of a new public school, which initially had been called Central Peninsula High School but later was renamed Skyview High. Boraas rode his bike down into the clearing and looked around. There, his gaze was arrested by the sight of the rolling wooded hills surrounding the north side of the campus. 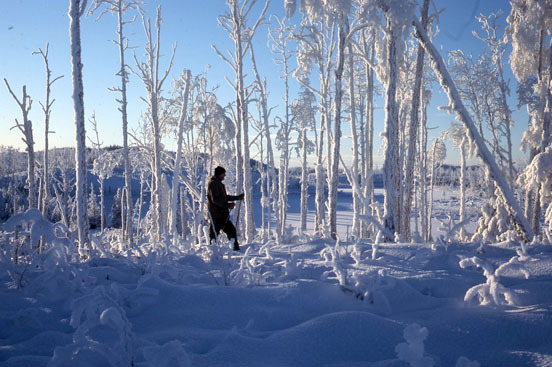 He imagined ski trails weaving in and out of those trees and over those hills, and he later went into the offices of the Kenai Peninsula Borough to investigate the terrain further and determine its ownership. It turned out to be all borough land and ideal for a new system of trails. From personal experience, Boraas had a strong sense of the landscape and conditions necessary to create a solid ski trails system, and he liked the idea of such a system being right outside the back door of a school, as the Hillside Park trail system lies adjacent to Service High School in Anchorage. 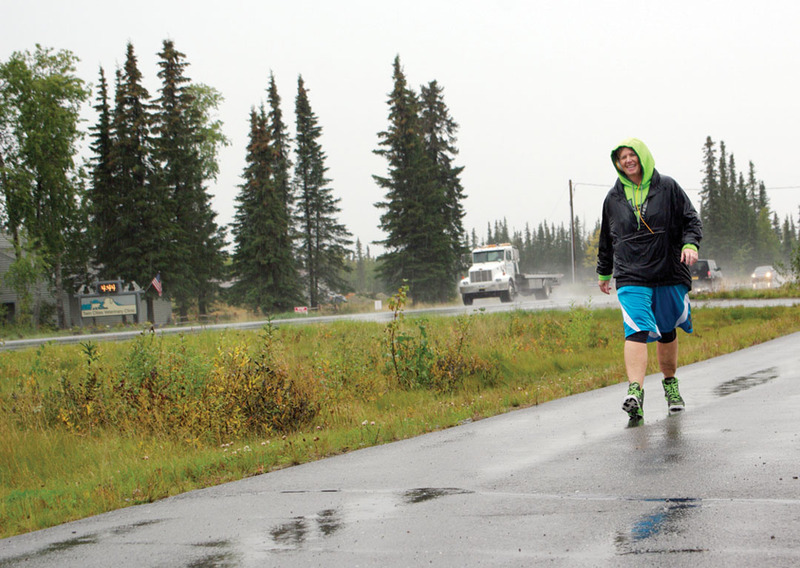 He considered the areas around neither Kenai Central High School nor Soldotna High School to be conducive to such a plan, but this new school, he thought, might be just the ticket. Although he’d already walked the property by the time he consulted with the borough, envisioning trails as he trekked, he enlisted a few friends to walk it with him and see whether their visions matched his own. They did. So it was time to enlist more help. Photo courtesy of Alan Boraas. 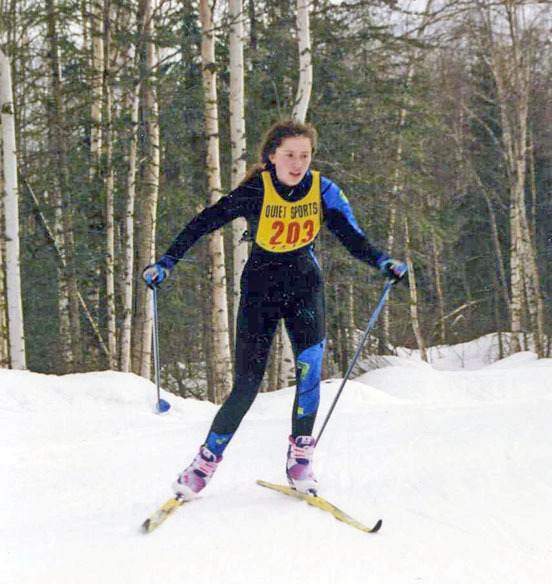 Kristin Boraas skis near Skyview High School in about 1990. The bib she is wearing was borrowed from Homer High School. Enter Lily Kloes, a third-grade teacher at Kalifornsky Beach Elementary School and a member of the ski club. After Kloes, Boraas and other club members had committed to paper some specific ideas about what a trail system would look like and how it could benefit the community, they made presentations to the board of education and the borough planning commission, receiving recommendations from each that the borough assembly grant them a five-year permit to build, operate and maintain a trail system next to Skyview High School. 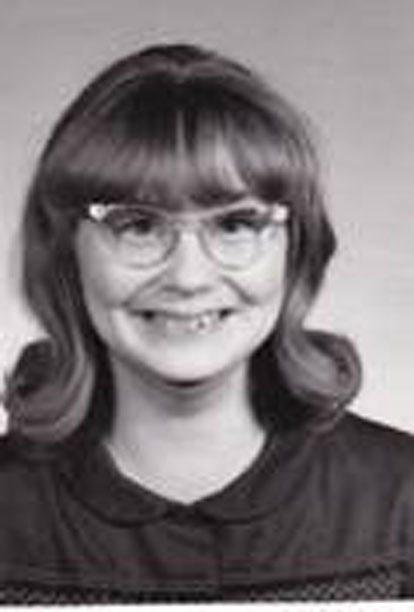 The next stop was the assembly meeting of May 19, 1987, at which Kloes employed her “enthusiasm of a third-grade teacher, a nonburned-out third-grade teacher,” according to Boraas, to convince assembly members that the ski club’s plan should move forward. After considerable debate, the club got its wish. Resolution 87-45, which passed by a 12-3 vote, permitted the ski club to build a public trail “described as being 12 feet wide and seven miles in length,” and required the club to provide a site plan to the borough administration, to flag the trail route, and to have that route approved by the administration prior to starting construction. 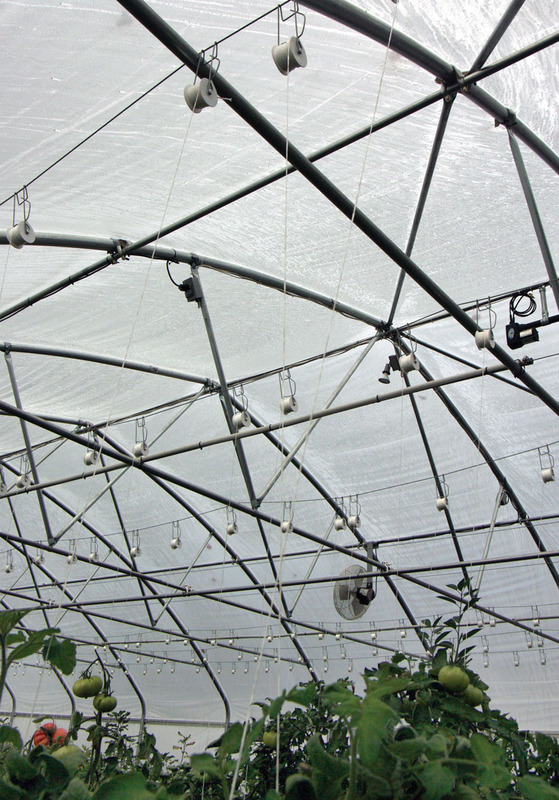 The club also had to provide an as-built site plan once the construction was complete. First, he said, the trail system must eventually fall within an area dedicated to that purpose so that “trails” becomes its essential function, rather than being a parcel of land that can be snatched away on some political whim. Second, the tails must be designed for both high-level skiers and average skiers. If they’re too difficult, they’ll appeal only to the elite, he said, and will fail to attract casual skiers or those attempting to learn. “Let’s face it,” added Boraas about the Tsalteshi system of trail, “it’s a prime chunk of property. If it’s only for a few elite-level skiers, it’d end up being a subdivision because you’d have no community buy-in.” And if the trails are too easy, said Burkholder, they won’t be good for racing. Third, good trail grooming is critical. The trails must be kept in quality shape all season long. Early grooming efforts at the trails by Skyview were done with a lot of homemade equipment, which worked, but over the years the quality of the equipment improved markedly. Fourth, the means of financing the trails must be sound and reliable. The Kenai Peninsula Nordic Ski Club decided early on to eschew federal, state and borough funding, aiming instead to build and maintain the trails through volunteer efforts. 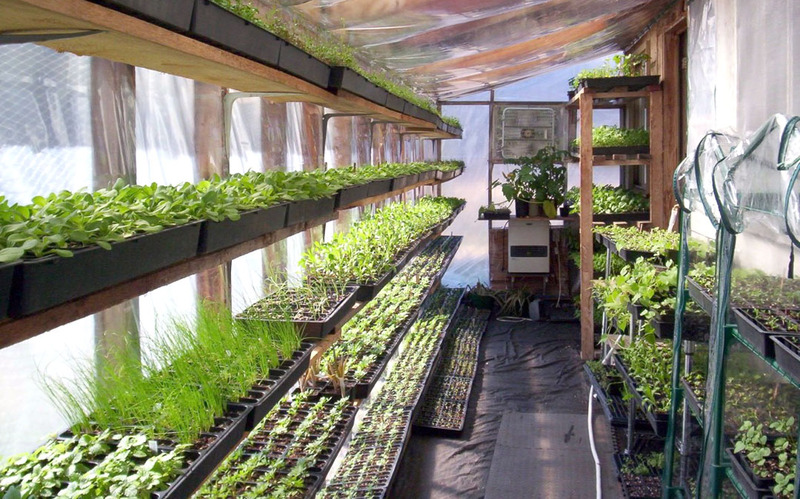 Later, trail supporters would apply for federal grants, while continuing to rely on association dues. Fifth, the trail system must have a name, a supporting organization and a permit. From the beginning, the trails near Skyview had a permit and a backing organization (first the ski club, later a booster club, and eventually a trails association). Its official name would come several years later. With those keys in mind, trail design and preparatory work commenced, but not without a few hitches along the way. Although the construction of Skyview was completed in 1988, declining district enrollment and budgetary constraints kept it from opening until the fall of 1990. It was during those intervening two years that a confluence of personalities occurred and brought success to the trails perhaps even more swiftly than even the most fervent supporters had expected.